The republican President Donald Trump is doing it again. He and his GOP sycophants in the White House and the US Congress have lied about how much of an US economic upsurge they were predicting of up to 4% per year for the foreseeable future. This increase in the GDP numbers was predicted to insure enough tax revenues to pay down the extra 10 year bill of $1.5 trillion dollars added to the US deficit to pay for the boondoggle of the 2017 Tax Cuts and Jobs bill which rewarded mostly the GOP donor class. This was a lie. The rosiest GDP numbers configured by reputable economists have the US GDP (Gross Domestic Product) figures growing at a rate of anywhere 2-2.6% per year annually starting in 2019 and for the next 10 years. But of course, President Trump doesn’t approve of this reality, and so he’s making his own predictions at 5%. His own internal White House experts have dampened the president’s expectations with growth estimates ranging from 2.8-3%. Then GOP lawmakers sold this tax cuts bill in a way that was misleading. 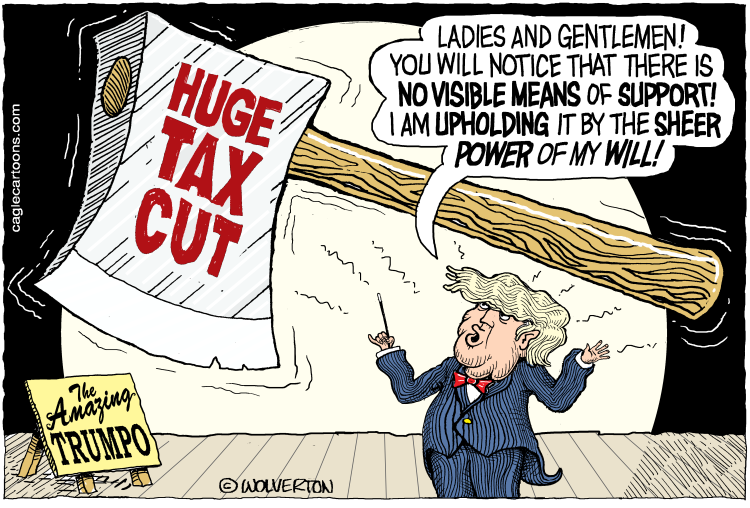 What they failed to explain to the American public was about how the $1.5 trillion dollars that they added to the US deficit (over 10 years) to pay for the 2017 GOP tax cuts bill, was a net amount. The actual numbers/ cost for the uber rich 2017 GOP tax cuts bill equals about $6 trillion dollars in tax breaks over a 10 year time-frame. 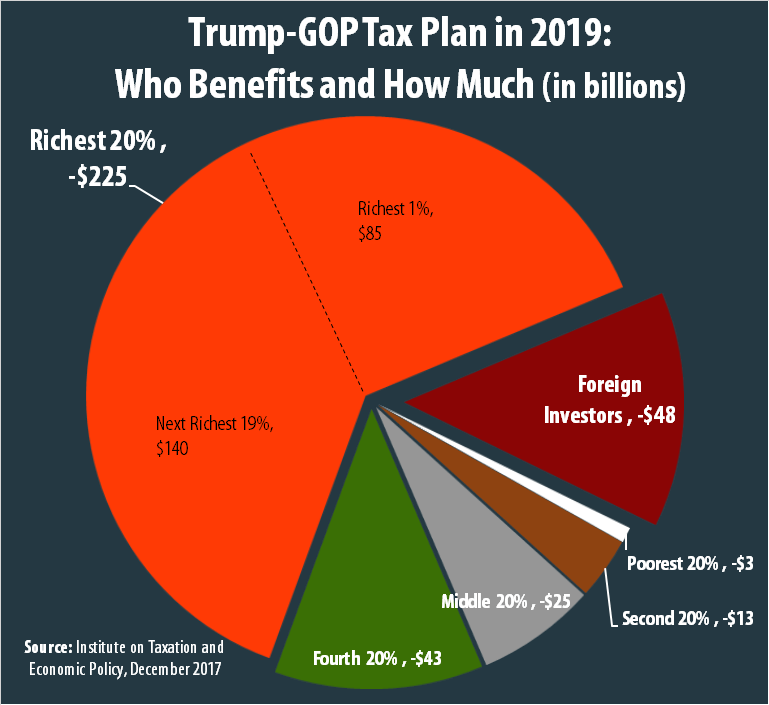 To pay for this $6 trillion dollar tax bonus for wealthy folks, the GOP slipped into the budget, a tax increase of a $4.5 trillion dollars to be levied slowly over 10 years on middle class/ poor folks. Then came the $1.5 trillion dollars added to the US deficit over 10 years to reach that $6 trillion total dollar figure. The American taxpayers will be picking up this bill. PS. In 2017, the GOP senators had planned to use the savings incurred by their ending ACA/ Obamacare to pay for their 2017 tax cuts bill instead of adding $1.5 trillion dollars to the deficit over 10 years. But fortunately, they were not able to kill Obamacare because of that one vote by the republican Senator John McCain. 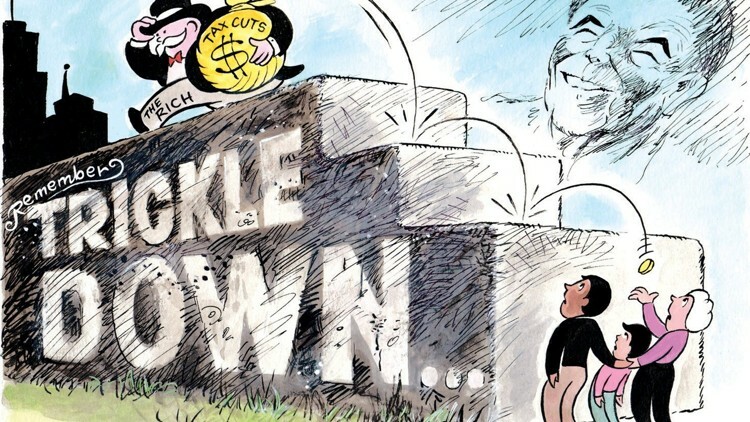 That GOP 2017 trickle down economics tax cuts bill was enacted at a time when the US economy was experiencing record soaring stock market increases, almost full employment, corporations making record profits while sitting on tons of cash. This is why President Trump has submitted the White House’s 2020 proposed budget plan where he and his GOP cronies’ only real solution to the problem of ballooning US deficits over the next decade is to cut entitlement spending. This is the big lie. This existing problem starts with a poorly crafted 2017 GOP tax cuts bill with lots of give-aways to the very rich which we could ill afford. This can be tweaked. “They also include steps to roll back regulations — many of which are at the state level and out of the control of Congress — that the administration says serve as a barrier to more Americans working. It cites occupational licensing rules, which restrict workers from entering certain fields without certification, and regulations that raise the cost of child care, such as caps on the ratio of children to staff in day care centers. On Wednesday, the Fed will release its new economic projections, which many analysts expect will show a slight softening in growth as a result of a prolonged trade war and an economic slowdown overseas. The forecast that the Council of Economic Advisers released on Tuesday predicts 3.2 percent growth for 2019 — nearly a full point higher than the growth expected by the Fed. The chairman of the Council of Economic Advisers, Kevin Hassett, said the administration’s faith in long-term economic growth came from their forecasters’ ability to correctly peg growth in 2017 and 2018. Gronda, I am so glad you wrote this, as I had been thinking of the “refined” projection announced last month. You correctly recall that Trump and crowd said the GDP would grow at 4% with the tax change and pay for itself. Tax cuts do not pay for themselves, with historical results coming around 20% to 30% of the lost revenue being regained in growth. As for the 4% initial projection, economists were pretty uniform that projection was too rosy. It should be noted when one quarter popped up to 4%, the White House was smug. Yet, the year finished at 3.1% growth. But, here is where Trump and friends revealed their modus operandi to rewrite history. They said the 3.1% growth was as expected due to the tax cut – excuse me, you said 4%. The president is not going to fix the mess he created with a ballooning US Deficit. The president is going to rue the day that he allowed that record making longest government shutdown to continue in January 2019. It’s not going to look good when the US GDP growth for the 1st quarter in 2019 is estimated to be only from 1.0 to 1.5%. He can look in the mirror for someone to blame. Then March 2019, is the second time that the business news is reporting that another Inverted Yield Curve has occurred. The first time in 10 yrs that this happened was in December 2018. Since 1955, whenever this happens, it is followed by an economic slow down to a recession within 2 years.